The group in a statement by chairman of the forum, Alhaji Mumakai Unagha and Dr SKC Ogbonna in a statement, said: “Information reaching us within the corridor of the National Secretariat of the All Progressive Congress suggested the National Chairman of the party Comrade Adams Oshiomhole is compiling names of major stakeholders of the party to be suspended or expelled. “The growing speculation also suggested that those to be suspended are drawn from the six geopolitical zones with the bulk from Delta State. “We, Core APC Forum including Ex-Presidential Aspirants, Governors, National and State assemblies wish to call on the National Working Committee of the party to halt such move. The National Chairman should act a true democrat rather than taking a decision that will affect the fortune of the party negatively. “The principle of a sustainable democracy evolves election and litigation which President Muhammadu Buhari acknowledged in his recent statement. Adam Oshiomhole should allow aggrieved party members that want to either tribunal or court to seek for justice to exhaust their energy. 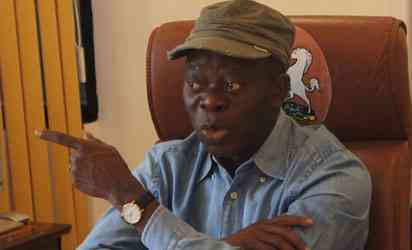 Adams Oshiomhole should call himself to order and allow a free democratic process in the party. “They should not be intimidated or threat of suspension. APC as a party may not have found itself in this mess, the National Chairman plague the party if he had allowed free, fair and just during the state congresses which spilt over to the party primary elections. “We, therefore, advised the chairman for the interest of the party to jettison such move should he ever conceived such or being advised to do so”.